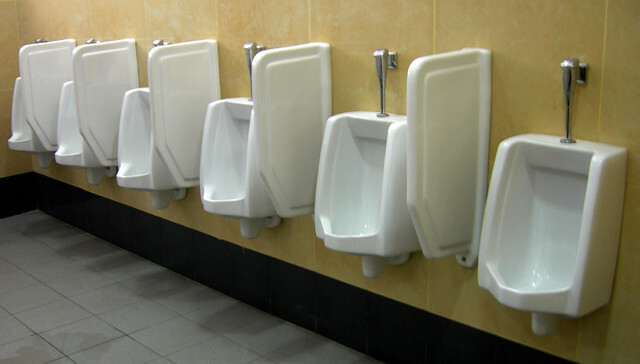 We have heard of urinals where you use your piss to play a video game, and that's brilliant, but the latest in pee-tech sounds rather annoying. The Colorado Department of Transportation is behind a unique initiative to stock bars around the state with "interactive urinal communicators" that play an audio message "mid-stream" urging pottiers not to drink and drive. Now, when guys walk into the men’s restroom at their favorite local watering holes, instead of just the sound of their own streams and/or one of those annoying video advertisement screens, they’ll hear another man’s voice, judging them by how accurate their urinary marksmanship is. They also ask bathroom users to "keep a constant stream on this urinal cake [to] see how drunk you are." Anyone with "Where are your pants? "-level intoxication is, predictably, urged not to drive. CDOT reports that both drunken driving and drunken driving-related fatalities were lower in 2013 than 2012, with the latter figure falling from 13 to nine.